​Compare Wi-Fi Supporting Smart Home Air Purifiers: GermGuardian CDAP4500BCA, Winix HR1000 or Blueair Classic? Air born polluters (such as dust, pollen, mold spores, pet dander, mite feces, smoke, etc.) that can be found in our homes can act as allergens causing serious allergies, even asthma in sensitive people. In addition, volatile organic compounds (VOCs) and germs (such as bacteria and viruses) that can be found in the air we breathe in our homes can cause various illnesses. Air purifiers are used to reduce or eliminate the concentration of these harmful airborne contaminants. Nowadays, the best air purifiers are equipped at least with a carbon activated filter to eliminate odors and collect some of the dust and lint, and a HEPA filter to get rid of most of the airborne allergens. HEPA filters can capture up to 99.97% of dust and allergens as small as .3 microns in size! Certain air purifiers are also equipped with UV-C (Ultraviolet C) light bulbs whose ultraviolet emissions can kill microorganisms such as bacteria and viruses including rhinovirus, E.coli, and streptococcus. Finally, some more advanced "smart" air purifiers that support Wi-Fi allow control of the unit remotely using a smartphone or a tablet. These smart units can also adjust automatically the airflow speed based on the air quality level; and when no pollution is detected for a certain amount of time, they can automatically stop to save energy consumption. We will compare below "smart" air purifiers that were the best rated by Amazon customers. This article will compare the GermGuardian CDAP4500BCA, Winix HR1000 and Blueair Classic 205/405/505 smart Wi-Fi air purifiers. These were not just the most popular among Amazon customers at the time this article was written, but they had also received excellent reviews from most Amazon buyers (average ratings of at least 4.5 stars each out of 5 stars!). Thanks to Wi-Fi support all the air purifiers considered here allow you to control the air quality in your home using your smartphone from everywhere and anytime as long as the units are connected to an 802.11 b/g/n router on 2.4GHz Wi-Fi network band. The product documentation/manual will explain in detail how the purifiers are configured into your home's Wi-Fi network. Bluetooth communication is supported only by the GermGuardian purifier. So, if you don't have Wi-Fi in your home, you could still control your GermGuardian purifier with your smartphone using Bluetooth. However, with Bluetooth, your smartphone can not be more than about 30ft away from the purifier. GermGuardian CDAP4500BCA is very quiet at its lower settings (1, 2 and 3), specially at setting 1 which is ultra-quiet, while at its higher settings (4 and 5) it becomes audible. Winix HR1000 is very quiet on low and medium speed settings: you may not even notice that it’s on. When high speed is selected, it sounds like a low fan, and when turbo which is the highest setting is selected, you can definitely hear it. But, all in all, it’s a very quiet machine. The noise level for the Blueair 205 varies between 32db and 56db depending on the speed selected. The noise level for the Blueair 405 varies between 32db and 52db depending on the speed selected. 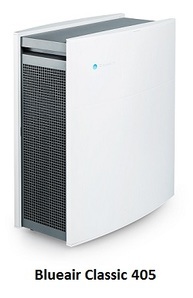 ​The noise level for the Blueair 505 varies between 32db and 62db depending on the speed selected. Note that the lowest setting of these Blueair purifiers is whisper quiet and even quiet enough for use in a baby's nursery! GermGuardian CDAP4500BCA: It includes SmartAQM, an air quality monitor that detects the amount of particles in the air and that can be set to auto-mode to automatically adjust the speed to optimize room air quality. Winix HR1000: Utilizing smart sensors, the unit consistently monitors the air around it. The LED indicator displays the air quality on a scale of good to poor (1-3). When the unit senses the quality change, it automatically adjusts the speed at which it’s running to create clean and pure air. 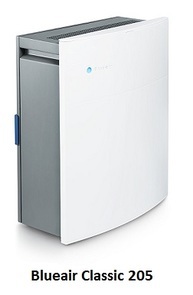 Blueair Classic 205, 405 and 505: These purifiers do not have a built-in air quality monitoring system. However, the App allows you to turn the unit's speed up and down as needed. Note that there is a separate adapter, the Blueair Aware, that monitors the air quality and which, when put into auto mode, automatically optimizes the air quality without having to adjust the unit yourself. Blueair Aware needs to be obtained separately and is available in the Amazon section below. HEPA filters capture 99.97% of allergens including dust, pet dander, dust mites, mold and pollen. According to the American Academy of Pediatric Allergy and Immunology, doctors recommend HEPA air filtration to reduce exposure to indoor asthma triggers. Activated granular carbon filter reduces odors from cooking, smoking and harmful VOC’s emitted by various household products (VOC = Volatile Organic Compound). The filter packs that come with GermGuardian CDAP4500BCA and Winix HR1000 both include an activated carbon filter. The Blueair Classic air purifiers come with ''HEPAsilent" filters that remove dust, pet dander, dust mites, mold and pollen. If odors and VOCs also need to be removed, the optional "Smokestop" filters need to be obtained. The Smokestop filter does everything the HEPAsilent filter does, and in addition, it removes odors, smoke and VOCs ​ . Note that Blueair Classic 205 and 405 come with one HEPAsilent filter pack, while Blueair Classic 505 comes with 3 HEPAsilent filter packs. GermGuardian CDAP4500BCA is equipped with a UV-C light bulb that works with Titanium Dioxide to kill airborne bacteria, viruses and germs. Winix HR1000 comes with built-in PlasmaWave Technology that works at a molecular level to safely break down odors, allergens, chemical vapors, and other indoor pollutants, without emitting harmful Ozone. The GermGuardian CDAP4500BCA timer can be set to run the air purifier for a specific period, from 1 to 8 hours. It can be controlled from the App. Winix HR1000 timer can be set to run the air purifier for a specific period, either 1, 4 or 8 hours. It can be controlled from the App. Winix HR1000 senses the amount of ambient light in the room, allowing the unit to adjust the brightness of the display. So which of these smart air purifies is best for you? The air purifiers considered here are excellent products as shown by the average rating each had received from Amazon customers at the time this article was written. Indeed, they had all received 4.5 stars (out of 5 stars). There is a good chance that you would be quite happy with any of these five products. The GermGuardian air purifier is the only one equipped with the germ-killing UV-C light. 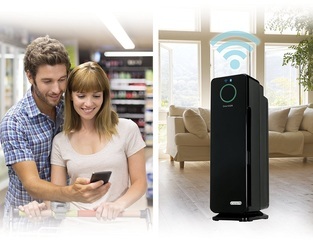 ​The GermGuardian air purifier is the only one that also supports Bluetooth. ​The GermGuardian air purifier has a longer warranty than the other two brands. 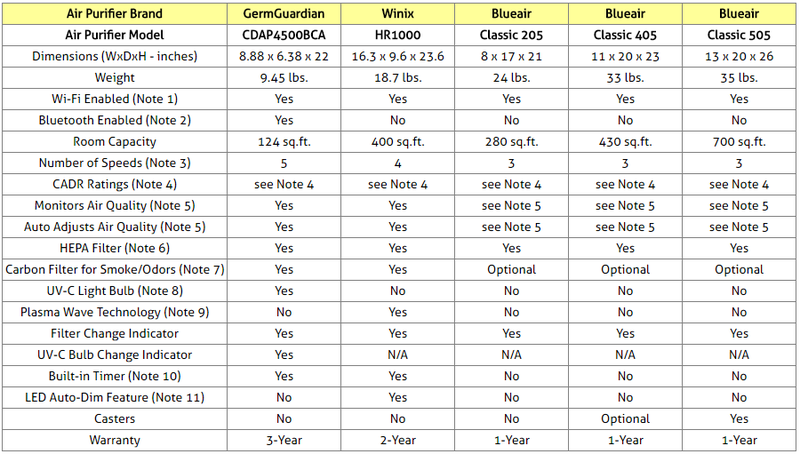 Both the Winix and Blueair air purifiers have higher CADR ratings than the GermGuardian unit (see Note 4 above). Only the GermGuardian and Winix units are equipped with a timer. 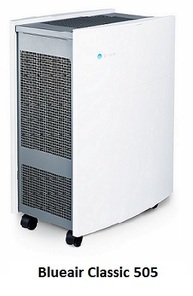 Only the Blueair Classic 405 and 505 purifiers can be equipped with casters and therefore are easier to move around. Before deciding which to get, you should keep in mind the above points, so you may choose the unit that will respond best to your needs. Please click the air purifier of your choice below for price information or to purchase.